Boarding the flight to Israel at JFK is proving to be an exercise in frustration and chaos. Not only has the flight been overbooked but adding to the confusion is a large, remarkably conspicuous group of haredi Jews (ultra-orthodox) Jerusalem bound. In variations of haredi dress – wide-brimmed hats, ringlets, and flowing black frock coats – they are blocking the entrance to the boarding lounge, chanting at prayer, fervently rocking back and forth, and creating quite a din. In Tel Aviv at Rustico, a crowded hip Italian restaurant in the center of town, I’m watching several members of staff lining-up shots of vodka and tossing them down in unison ─ a “tip” from a generous patron – then carry on waiting tables giving new meaning to the old adage, in Jerusalem you pray, in Tel Aviv you play. Not exactly what you’d expect from the first Hebrew city. Tel Aviv, you will find, is surprisingly secular with a work hard/play harder ethic. “A best kept secret,” confides the American chef of the tiny restaurant, Oasis, which has just opened across from the Carmel Shuk with rave reviews. Away from the tranquil neighborhoods, Tel Aviv is in perpetual motion. It is noisy, spontaneous, and, by the looks of it, fueled by its famous strong coffee. The city is awash with cafés and restaurants that are always crowded, at all times of day and night. On busy Dizengoff Avenue there are seven cafés in one block alone! 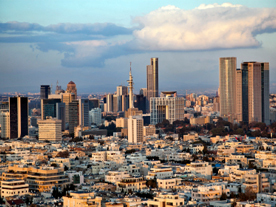 For a small city, Tel Aviv is well on its way to gaining global status. Habima, Israel’s national theatre, the crown jewel at the top of Rothschild Boulevard, recently got a multimillion dollar face lift. And the Tel Aviv Museum of Art recently opened its impressive $55million new wing with a stunning show by German artist Anselm Kiefer, putting Tel Aviv on the map of international cultural destinations. Settling into my bistro chair at “R”, one of the café kiosks on Rothschild Boulevard, the Shabbat promenade of an affluent young crowd is strolling by. There are times when Tel Aviv seems to be inhabited by only the young. In the distance, I can see cranes towering over the skyline, a sure sign of a prosperous economy. One skyscraper under construction is designed by none other than Richard Meier. Just off the boulevard, in an elegant residential triangle, Bauhaus buildings that have been awarded UNESCO World Heritage status are being refurbished to their original splendor as part of the city’s preservation efforts. Gentrification has also spilled over to the adjacent chic area of Neve Tzedek. 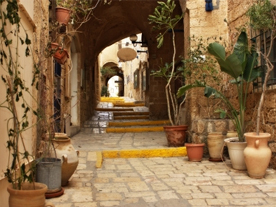 This village within a city was formerly a nineteenth century enclave of Orthodox Jews who settled there. 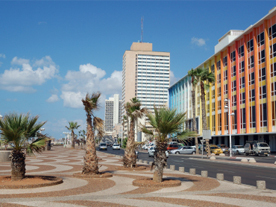 Now, it is one of the most expensive residential areas of Tel Aviv. At the heart of the neighborhood is the renowned Suzanne Dellal Center for Dance surrounded by trendy designer boutiques and restaurants flanking cobbled Shabazi Street. 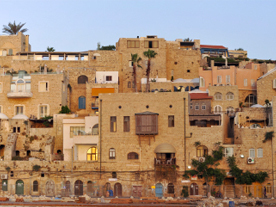 Renovations continue up the road, beyond the sand dunes, to the historic port of Jaffa. Converted warehouses that once housed the famous Jaffa oranges have been transformed into restaurants and galleries, and is now a thriving area. From Jaffa you can walk or cycle up the newly completed (20K long) beachfront promenade – a great way to watch the watersports ─ as far north as Herzliya. The beaches are white and wide, dotted with colorful umbrellas and beach cafés. As the sun sets over the Mediterranean you can catch the rhythmic sounds of Brazilian Jazz wafting on the sea breeze. At night, Tel Aviv is a safe place, you can walk alone anywhere at any hour, one of the cities greatest pleasures. As one would expect from a nation that eats salad for breakfast, food is plentiful, fresh and mostly organic. Besides the teeming and colorful Carmel Shuk, at the north end of the city there is a bustling elite farmer’s market, Shuk HaNamal, in a converted hangar only steps away from the sea. 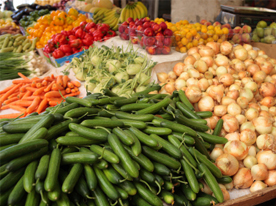 If you are wary of visiting the markets alone, organized food tours will guide you through them from Tel Aviv to as far as Galilee. Much has been said about Tel Aviv living in a bubble. Maybe it’s important to live life free and unfettered when you are surrounded by unsympathetic neighbors and under constant threat of war. It is admirable that Tel Aviv and this country, this minute slice of land that Netanyahu famously covered with his index finger when asked to find Israel on a map, continues to flourish in the face of adversity. Aviv is Hebrew for “Spring”, and there is no doubting that this is Tel Aviv’s Spring.